Supporter of Polish cycling since 2015, Telecommunications company Netia will once again sponsor a Pro Continental team, with aims to promote Polish cycling. Faroe based fishing enterprise Vónin joins them with aims to develop cycling in the Faroe Islands and to increase their prominence both globally and in Northern Europe. We look forward to the upcoming 2018 season in partnership with Netia and Vónin! Netia - Vónin, Polski Rowerowy na Światowej scenie! 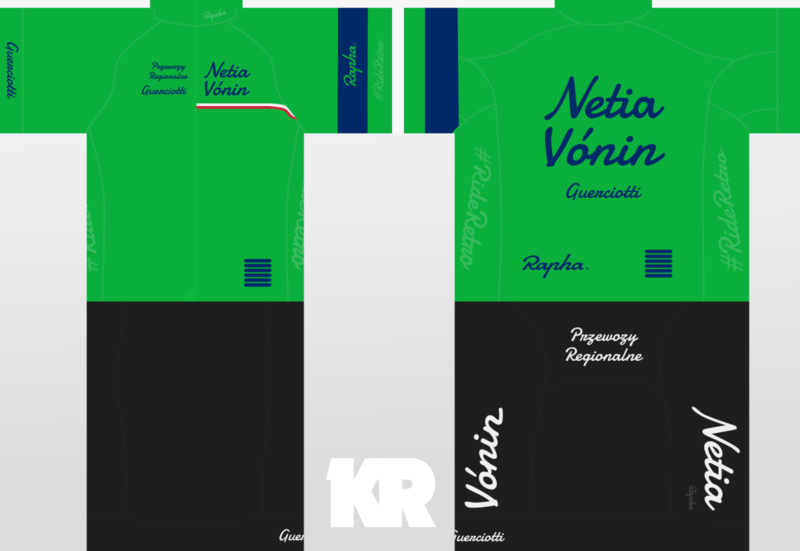 Thanks to the excellent Krisa of Rapha, we will race in this stunning jersey for the 2018 season. It is almost the exact same jersey as last season, however with all our sponsors continuing on their 2 year contracts, we chose to maintain our association with our bright green colours. Netia signed on until the end of 2019 last season, with the clause that Polish hero Michal Kwiatkowski is racing in their colours. A stage win in the Tour de Polonge - our 6th team win in our home nation, shows fans what our nation can achieve and Przemyslaw Kasperkiewicz leads a Netia training program to show Polish youths the path to success. We look forward to developing Polish cycling with Netia for another season! Vónin's main goal is to improve their image in Northern Europe and their countries of operation but they also want to see Faroe cyclists have a representation on the world stage, especially with talented riders such as Torkil Veyhe beginning to come through. This season they hope to see Gunnar Dahl-Olsen and Jóanis Albert Nielsen in winning squads and hope for Torkhil Veyhe to take his first win, after wearing the KOM and youth jersey in the Tour of Eritrea this year. Aside from Deins, it may seem that not many riders are available this transfer season, that is not entirely true, it is true however that we hope not to release any of these guys, so, unless transfer plans change, we would require a pretty good offer to see anybody leave the team but that shouldn't discourage anybody from enquiring about anyone you might be interested in - you might get lucky. It'll be interesting to see how you square your sponsor's requirements with your own goals - is promotion or development of Faroese cycling the aim? @Booker - Thanks! Looking forward to race against you guys as well, we haven't made the best use of our head start honestly, it's not too hard to beat us given how close to relegation we just were. The balancing of sponsor targets with team goals has been a factor for us since our inception, and honestly looking at our squad, I don't think we should consider promotion this year, rather wait until next year or the one after as Kaspa and Pedersen near their max, so development of Faroese cycling will be a focus for us I guess this season, though there really isn't any of significant interest this time round, so it's more focussing on developing Veyhe and Nielsen, who are both fun projects. So this season may be more a matter of getting in some new blood who can support and facilitate a promotion once Kaspa, Pedersen and Veyhe can lead the team. @Jandal Thanks! <3 Will be fun to finally race against our Kiwi buddies! @whitejersey - Yeah, I was just really afraid to lose him, especially after last renewals I stuffed up majorly, means that we can't really make as a good a team for this season as we could, but we are safe with our long term plans intact this way at least. @Abhishek - Thanks, looking forward to racing against you as well! Yeah it will be a little tricky, I guess the method lies in avoiding the temptation to sign more talents (though I have one or two on my 'must sign' list ) so that I can focus on signing riders who'll keep us safe until our talents max and we can consider promotion. Thanks for the support! I do appreciate how you've set your team up as there are certain similarities in the way in which we barely stayed in the division while looking after talents that we'd signed. I will always follow your team as it's a long-term project worth keeping an eye on! Thanks!! Yeah, last year the threat of relegation made things very scary but (for both of us) having some awesome talents max in a few season will make up for it, which is something our team really looks forward to! Indeed. I'm very happy I got my big guns through the level-up period back when renewals still had indications after each round, and when you couldn't offend riders. That allowed me to get a good idea of how the wages develop, but if I had to start now, I'd struggle a lot too. A little glad to know I'm not the only one who's suffered the fear of losing (and thus overpaying) your biggest talent. That is a little bit of why I still feel that being able to offend riders is too harsh, you do already have the time pressure of 3 rounds, though I'm biased because I've been hurt by it.